The press is capable of pressing 2000L| of apple juice in an hour. With an average 70% yield, it squeezes out 225-250 Litres of juice per 800lb bin of apples. The pressing capacity is achieved with the onboard bin tipper which accommodates all bin types and sizes. It dumps fruit quickly and efficiently into the water basin where it is then lifted up the elevator. 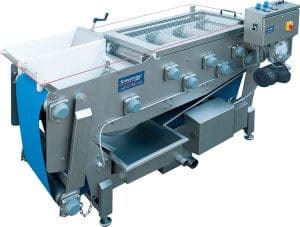 The fruit drops into a grinder and the pomace is fed directly onto the continuous belt press. Depending on the service required, the juice is pumped into IBCs for further treatment or stays onboard to be pasteurized and packaged. The press can also extract juice from other fibrous fruits and vegetables. Ask us how.